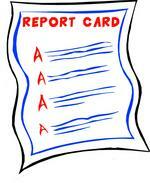 I was always the type that avoided showing my report card to my parents especially from Jr. High on. This was because I was an unmotivated student but we've talked about that before. For years, we have all used the A, B, C, D and F grading scale for an understanding of class performances. Some people have started to believe that we pressure children too much for getting a B instead of an A or even a C instead of a B. Pressure at this early of a formative stage in a child's life could lead to horrible diseases... like acne. Ok, I don't know why people are worried about pressure on students but the people who are have decided to make changes. According to Ohio's Akron Beacon Journal, their city will be adopting a more strict guideline for elementary school grades (A = 100% to 93%, B = 92% to 85%, C = 84% to 77%, D = 76 to 69% and an F = below 68%.) What does that mean for children that are already struggling with our school systems? Stress, confusion and a job at the quickie-mart. As a way to relieve some of that grade stress, some people have decided to change their grading system even more radically. Florida's Palm Beach Post reports that along with the normal Palm Beach County elementary school report cards will be a number 1, 2 or 3 next to their grade. "Under the formula, a 1 means the student is working a year or more below grade level, a 2 indicates the student is working less than a year below grade level, and a 3 means they are working at or above grade level." Many reasons for these changes are blamed on the grade-level expectations placed on teachers by the No Child Left Behind Act. I have even heard reports of changes that have brought about triangles, squares and circles as actual grades (yes, triangles just kind of look like A's, don't they?) Princeton professors are actually required to give a maximum of 35% of all their students an A. I've heard of grading on a curve but what if you really do have 50% of all the students in a class scoring amazingly high equal scores throughout the semester? (Ok, yes... I'd check for cheating, too.) All this makes me wonder, if we are so worried about how we critique and define our students, why do we still give pre-schoolers and kindergarteners report cards that say E for excellent, S for satisfactory and U for unsatisfactory? Why not start the kids off right and get them used to one way of being judged and throughout their academic career? Yes, I'm still confused with how a D could be below satisfactory and not quite failing but least I had something to judge my lack of progress by. When it all comes down to it, aren't we a little too preoccupied with evaluating performance on paper and not enough with the actual time a teacher can spend "teaching"? I hate this grading curve crap. Well, granted in college, it was a plus. Grades are not a reflection of IQ, rather they are a reflection of effort. John might not be as smart as Jane, so he will just have to spend a little extra time studying for a test than Jane has to. From my persepctive, most of the parents I have simply do not care if their child is getting a D, there is not enough pressure from the parents for the students to perform. If my mom doesn't care why should I? As for changing the grading system, first of all we have a 1,2,3 system for kids in the primary grades, (K,1,2) and as they get older it changes to A,B,C. The more strict guideline is really interesting to me. My sister-in-law is a Chemistry Professor in Oregon and she was saying they had to lower the scale so that more students can pass. A C range is something like 60%-68% (Don't quote me on the exact number) The really scary part is that most of her students can't pass a simple chemistry 101 class and the majority are trying to get into nursing school. I hope I do not need to end up in a hospital when I visit them. Yes, we are a little too preoccupied with evaluating performance on paper, NCLB is proof of that, but I am still hopeful that I have taught my students something over these last few months. I think grades are important. They show whether the kid is or is not learning the material. And, I don't blame the kid for any grade they get, if they're not learning the material, they're not learning it. Lowering the standards or using a curve only adds to the problem. If they're not catching on, find a different way to teach them, or motivate them. Something that Teri said caught my eye and left me wondering, if Jane is getting good grades and not studying much, is she also not being challenged enough? I don't know, call me crazy, but I would rather see my kid study for an hour or so and making C's and B's, than study for 15 mins and making A's. Hmmmm so grades in school are no good, but I get evaluated annually on my job performance and my raise is based on that. Isn't that a type of grade? I know I get tested at my job every day about my knowledge, if I can solve the problems presented to me I pass. Whats so different? I love the diversity of these comments. I do think that evaluation happens all around us and always will. What I do find interesting is that with education, a student's grade reflects not only their comprehension and effort but that of their teacher. Something about standards. These standards change everywhere and are not often interpreted the same way. Because evaluations are based on standards, job performance is critiqued differently. I personally remember a friend's boss that asked her (as well as other employees) to write out what they need to work on most and where they exceed expectations. By saying the same problems each time, meant that you weren't working hard enough on them so you would probably have to keep coming up with something new. So grading yourself isn't any easier. These are ALL very good points and arguments. And I think you're all right.